Singapore, 16 January 2019 – For the fourth consecutive year, Epson Singapore and Geylang International Football Club (GIFC) announced the renewal of their partnership as the Platinum sponsor for the new season until the end of December 2019. This sponsorship comes on the heels of a strong three-year partnership since 2016 between GIFC and Epson, and is a testimony to the depth of the relationship and mutual commitment both organisations have in their aligned vision of developing and elevating the Singapore football scene. Sports and youth development have been the cornerstone of Epson’s Corporate Social Responsibility efforts, which in 2018 have centred around Epson’s #EXPECTMore campaign. 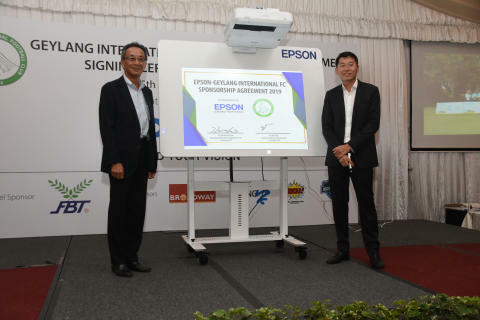 Through this campaign, Epson played a crucial role in co-organising Epson Youth Challenge 2018, a youth football tournament since 2017, to encourage burgeoning football talents in Singapore to pursue their footballing dreams. The youth tournament achieved great success with an expanded size and scope, which garnered a total of more than 1,400 youth participants. As part of Epson’s partnership with Matsumoto Yamaga FC, Epson and GIFC also provided four Singaporean youths the opportunity to embark on a once-in-a-lifetime opportunity in November 2018, for a 7-day training stint that not only exposed the boys to Japanese coaching methods and new training techniques, but also provided them with a unique cultural immersion experience of an authentic Japanese homestay. Two out of the four youths were selected as Most Valuable Players based on their performance during Epson Youth Challenge 2018. The sponsorship signing ceremony between Mr. Toshimitsu Tanaka, Managing Director of Epson Singapore, and Mr. Ben Teng, Chairman of GIFC was held today at Warren Golf Country Club, Singapore. Epson and GIFC are also exploring new platforms in providing and reaching out to more local youths with the opportunity to participate in soccer clinics organised by overseas clubs. More details will be shared later. Prior to publication, it must be approved by Epson Singapore. Epson Singapore and Geylang International Football Club (GIFC) today announced the renewal of their partnership for the third consecutive year, making the imaging and innovation leader the football club’s Platinum sponsor once again, until the end of December 2018.